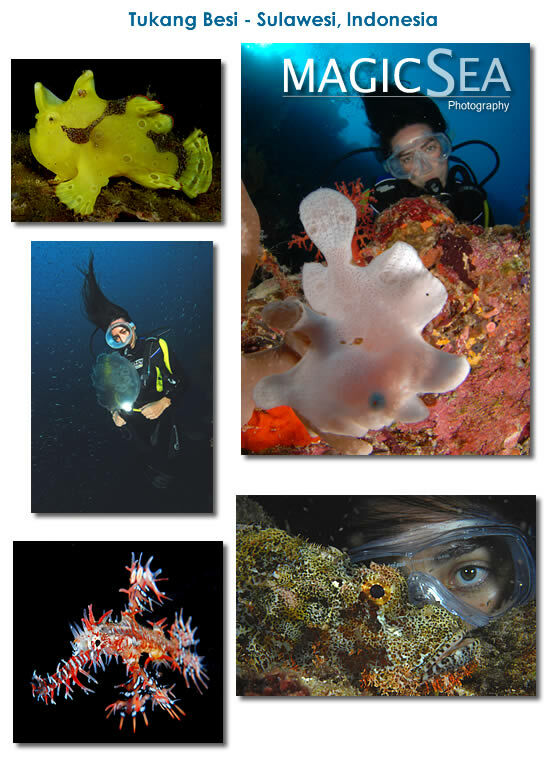 August 2011: Komodo in Indonesia has very special diving, strong, nutrients righ currents swept the islands and lures interesting and abundant marine life. 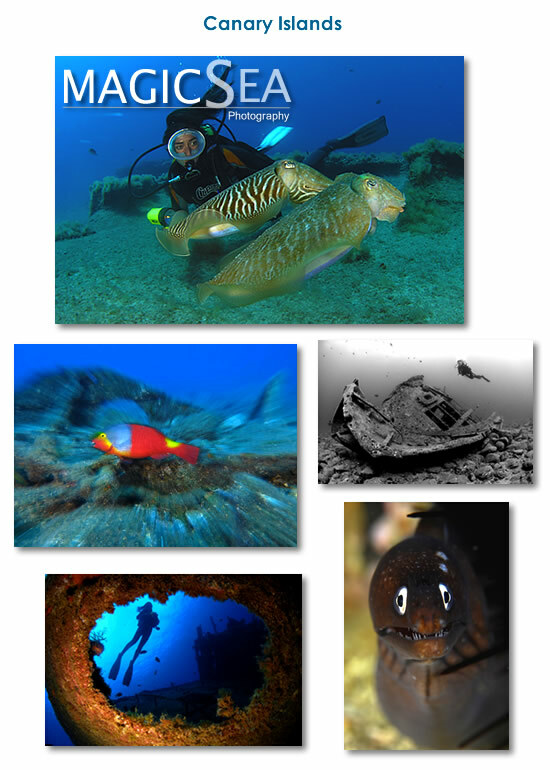 July 2011: The reefs and wreck of the Red Sea and its clear water are always a joy to dive. This time am exciting encounter with hammer head sharks was the highlight of the trip. Aprilr 2011: We love doing this 12 days cruise every year. Departing from Raja Empat and arriving at Lembeh, passing by the Mollucas islands. The best possible mix of tropical diving. 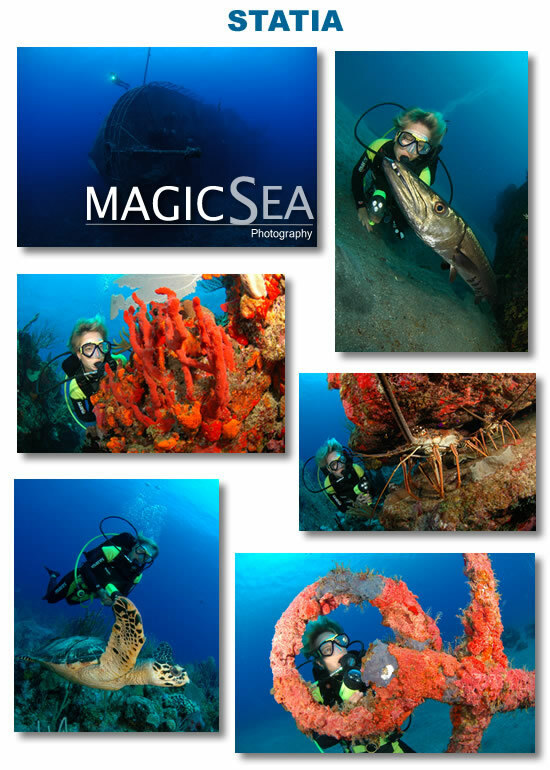 December 2010: I visit once again Palau, this time with a small group of photographers. We enjoy the luxury service of the Ocean Hunter III live aboard. 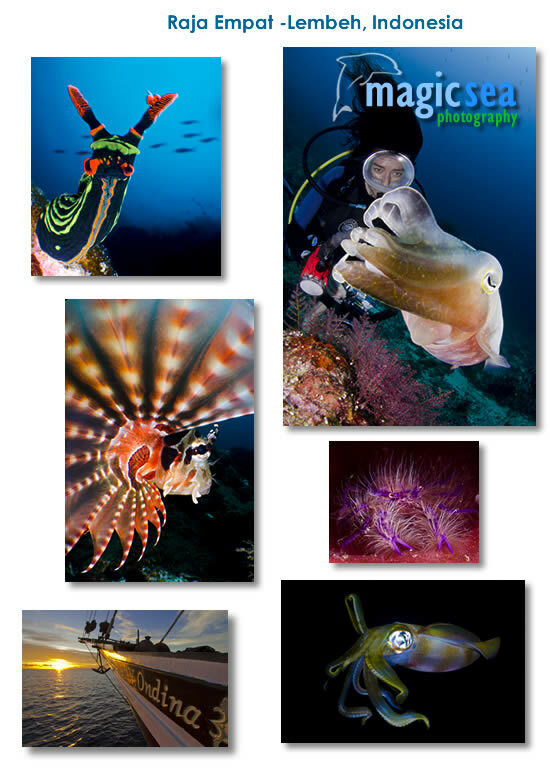 August 2010: On assignment for Sport Diver magazine. I had the chance to visit Hanifaru where the largest concentration of Manta Rays in the world gathers to feed on plankton. I had the visit of a couple of whale sharks that joined the feast. 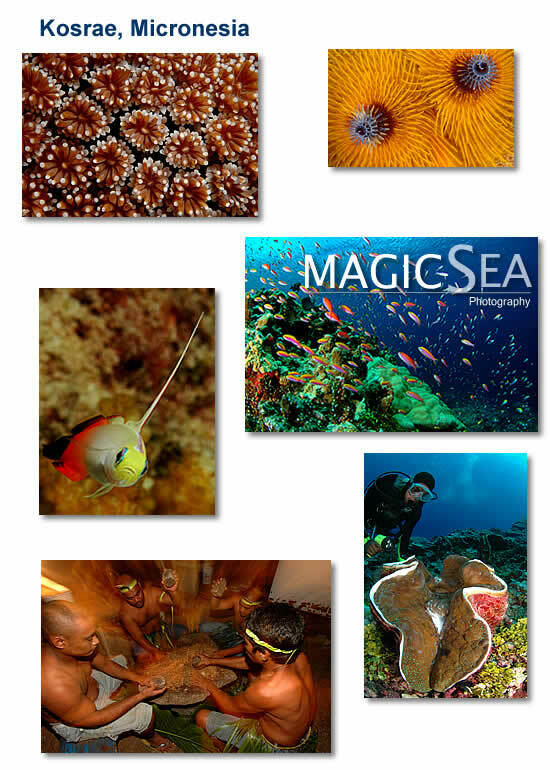 June 2010: Leading a group of photographers to the remote reefs of Tubbataha and Apo reef. 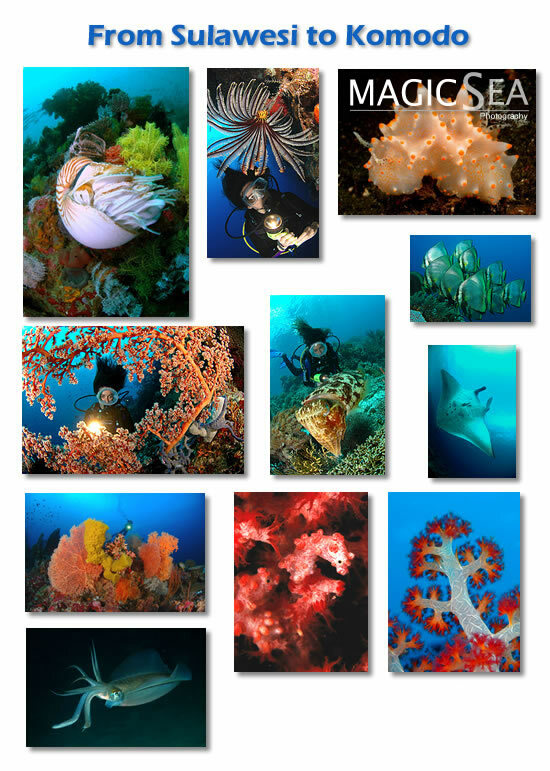 We also dived the wonderful reefd of Anilao and enjoyed the variety of critters there. 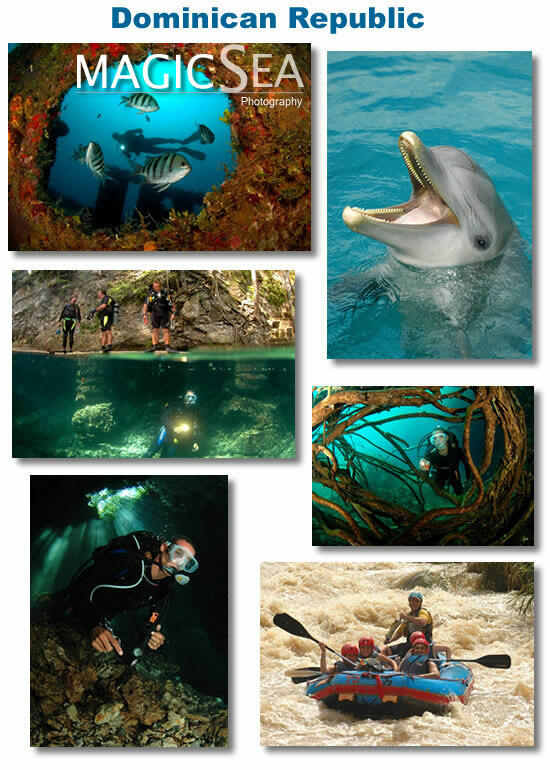 Then a jum to Palau to dive the best dive sites of sharks, mantas, wrecks and caves. 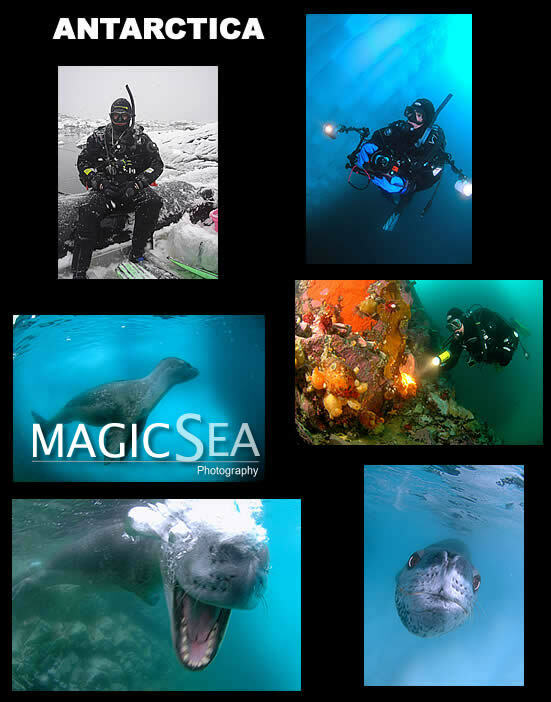 March 2010: Leading a group of underwater photographers. 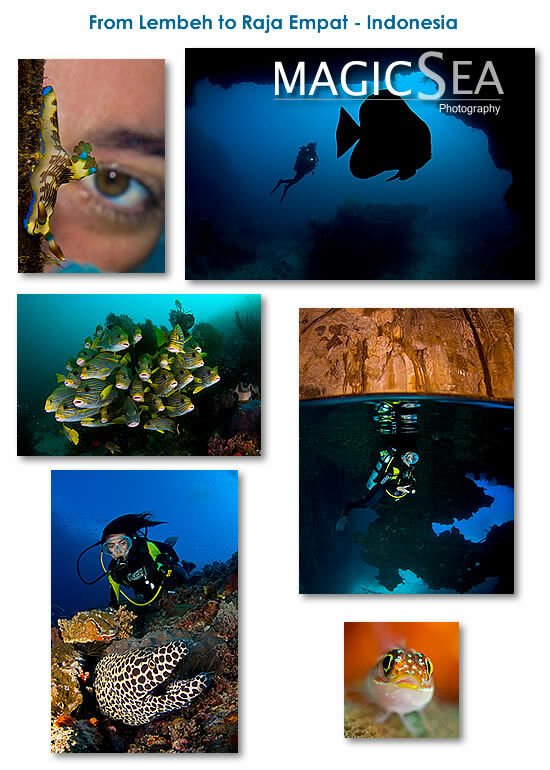 Revillagigedo is one of the wildest places where you can dive. Several species of sharks, schools of hammerheads, huge manta rays and humpback whales are just some of the encounters you may find underwater. 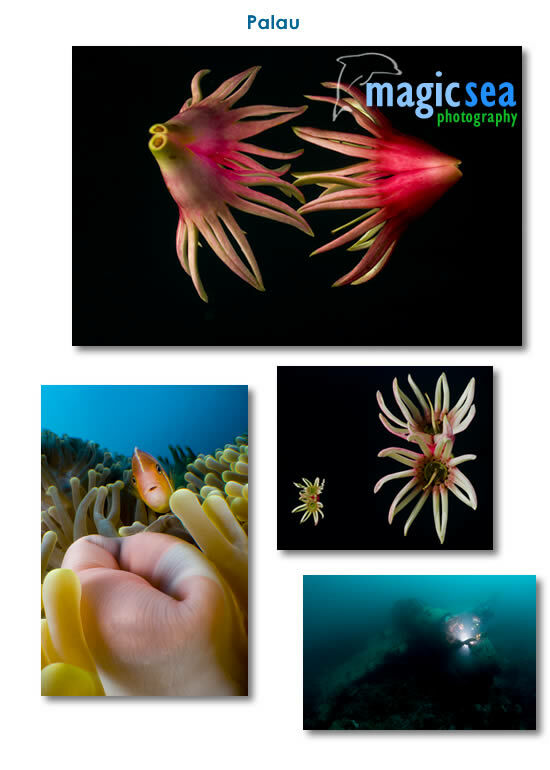 February 2010 : On assignment for Sport Diver Magazine I have visited the wonderful islands if Fiji which are known as the soft coral capital of the world for a reason.Tthe colors and profusion of soft corals is stunning. Wild pots of dolphins, mantas feeding on plankton and many sharks including large tigers were very exciting too. 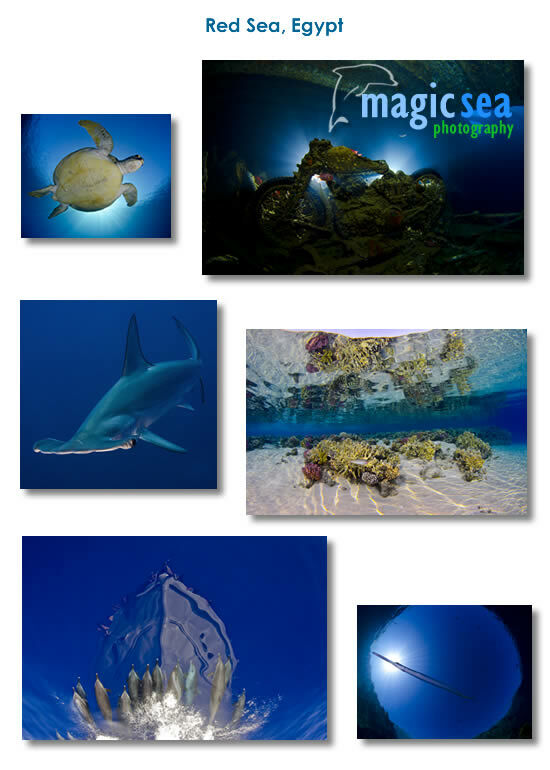 October 2009: Teaching a photo seminar in the Red Sea with a bunch of fun Spanish photographers. We had a great time enjoying the clear waters and colourful sealife of the Red Sea, and we were lucky to find the Oceanic White Tip sharks. October 2009: This the the third year we attend the "Mogan Fotosub" an invitational photo competition that gathers some of the top European photographers. This year we had the winners of all past editions and we got the 2nd prize and the special prize to the best photo of the Yellow Submarine. July 2009: Even if it is just a few hours drive from home, it had been a while since I dived the Meditterranean Sea. I was very surprised to see the amount of sea life in the Marine Reserve of Cabo de Palos, arounf the Islas Hormigas, in Murcia-Spain. There were lots of large groupers which means the Marine Reserve is doing a good job conserving targeted species. June 2009: Back to the Philippines, this time teaching a photo seminar with a group of spaniards. We stayed in Donsol where we photographed whale sharks and explored the remote reefs of Tubbataha and Apo in a liveaboard boat. 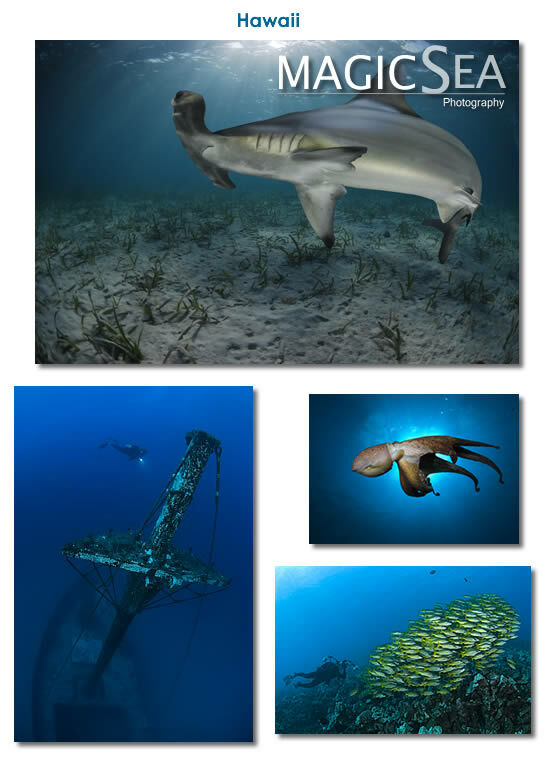 We found very healthy reefs with huge schools of barracuda and jacks. Sharks were common in most dives too. 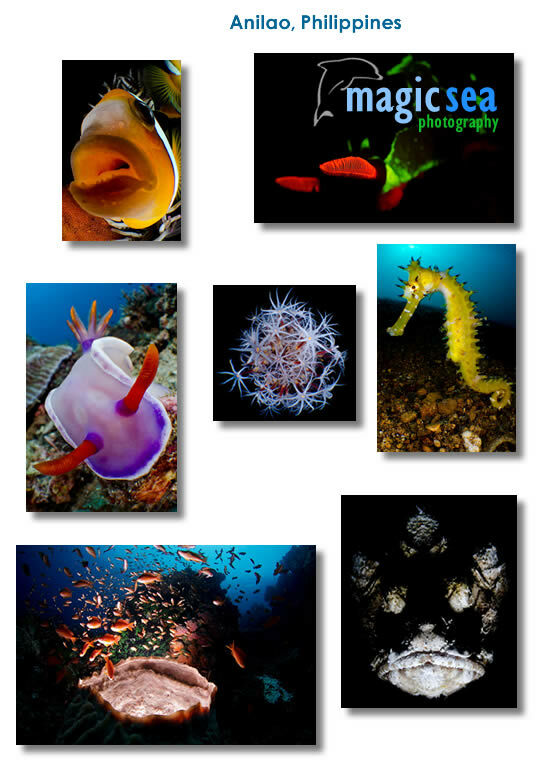 March 2009 : Doing a photo seminar we have gone from Lembeh, the capital of Muck Diving, to Raja Empat. We have passed by the Mollucas which was a nice surprise. We have found the best coral reefs in the world. 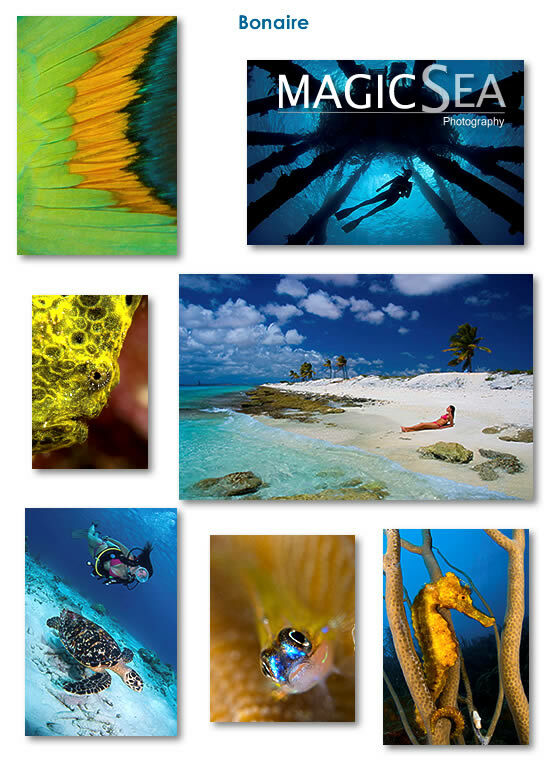 Colorful soft corals, huge sea fans and plenty of marine life have cautivated us. We are alrady planning next year trip doing the same route. December 2008 : Lanzarote is one of the Canary Islands which belong to Spain. It is in the west coast of Africa, 90 km from Morroco. I attended a shoot-out photo competiotion, where I place in 2nd position. 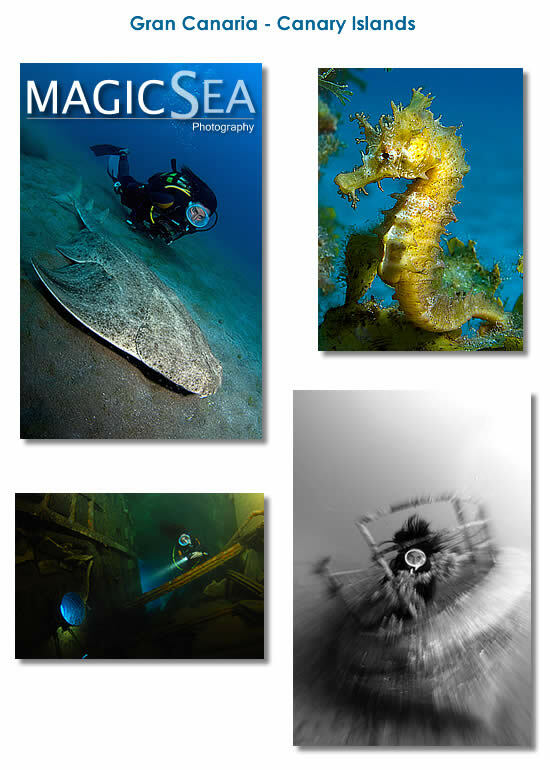 October 2008 : On assignmet for Sport Diver Magazine. Roatan belongs to the Bay Islands of Honduras and it has some awesome dives with sharks and dolphins, plus few wrecks and a fish or two too ! 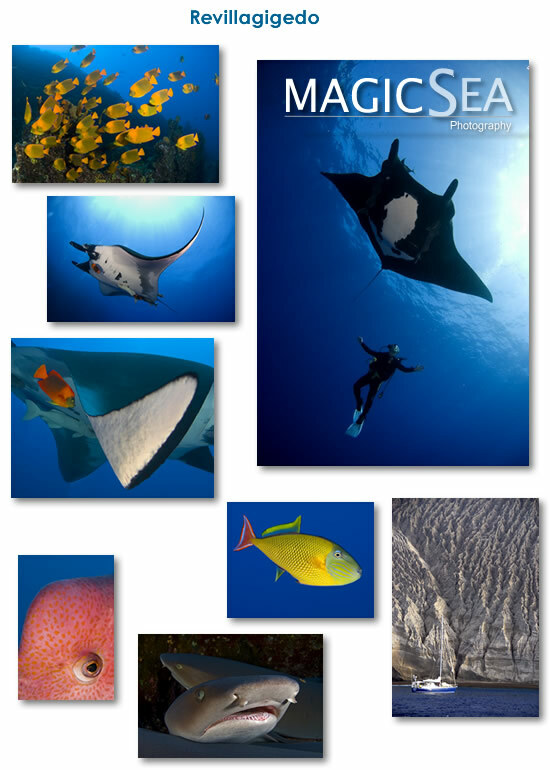 September 2008 : On assignmet for Sport Diver Magazine. All the car plates in Bonaire read "Diver's Paradise", and there is a reason for that; wonderful coral reefs, lots of critters and easy shore diving make this place a heaven for divers hungry for loads of bottom time. June 2008 : We assist the prestigious photo shootout in Mogan - Gran Canaria and won the FIRST PRIZE with the best collection of 6 images. Maite also received the prize to the Best Underwater Model. We really enjoy this island and this time we got to dive in the nort side where we found interesting seahorses and angel sharks. 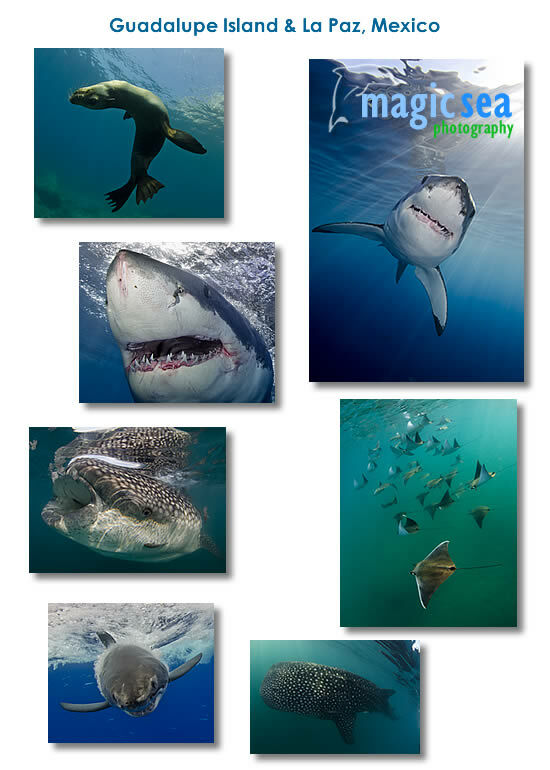 April 2008 : The Revillagigedo archipielago is formed by 4 islands: Socorro, San Benedicto, Clarión and Roca Partida. 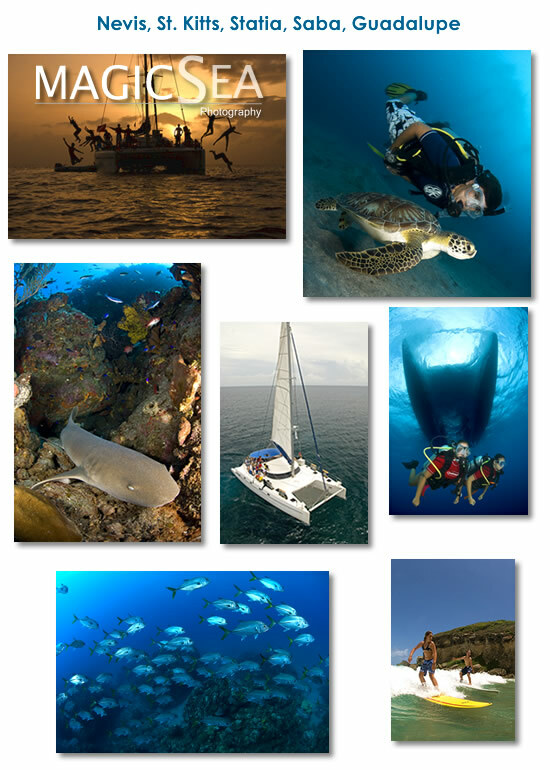 Very exciting diving with manta rays, sharks, whales and much more. 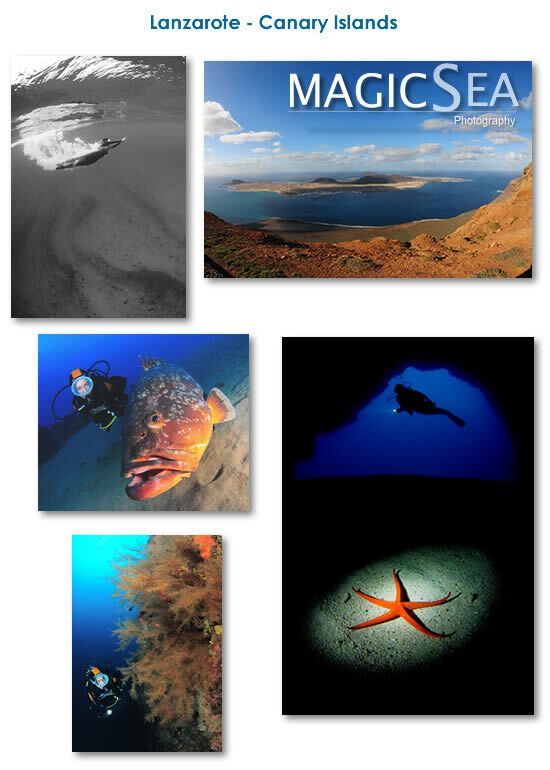 October 2007 : We went to El Hierro in the Canary Islands and were captivated by the beauty of its clear waters. The groupers over there are simply amazing. August 2007 : Looking for the rare Monkfish in the dark and cold waters of the Bay of Biscay, Spain - Hometown of MagicSea ! 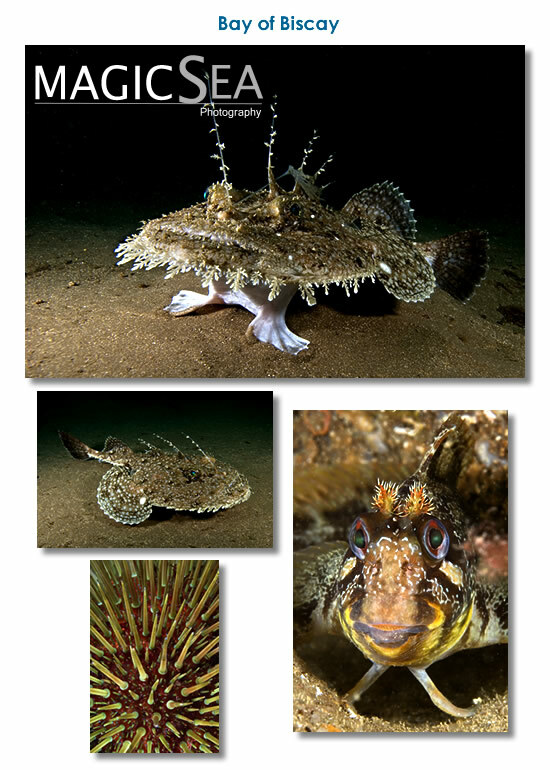 Monkfish are becoming scarce due to their delicius taste and are rarely seen at dephts shallow enough for divers. This one was at 130 feet around a shipwreck in Machichaco cape. July 2007 : On assigment for Broadreach I visit agian the chain of islands going from Nevis to Saba and this year I include also Guadeloupe (Gwada for short). Sun, Sail, Surf and of course... Dive !! June 2007 : We attend to one of the most prestigious photo competition in Europe. 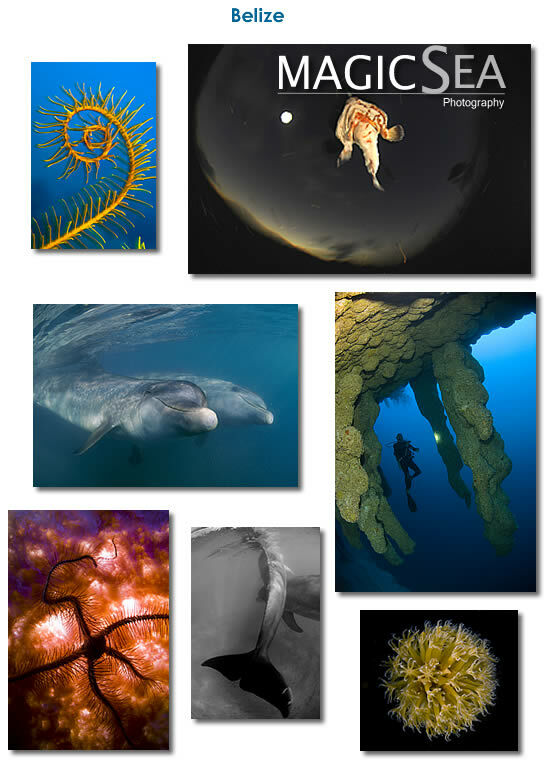 The top European and world champions meet in Gran Canaria to take the best underwater photos of the island. Maite Uribarri got the prize to the Best Model and Carlos Villoch won the bronze medal. 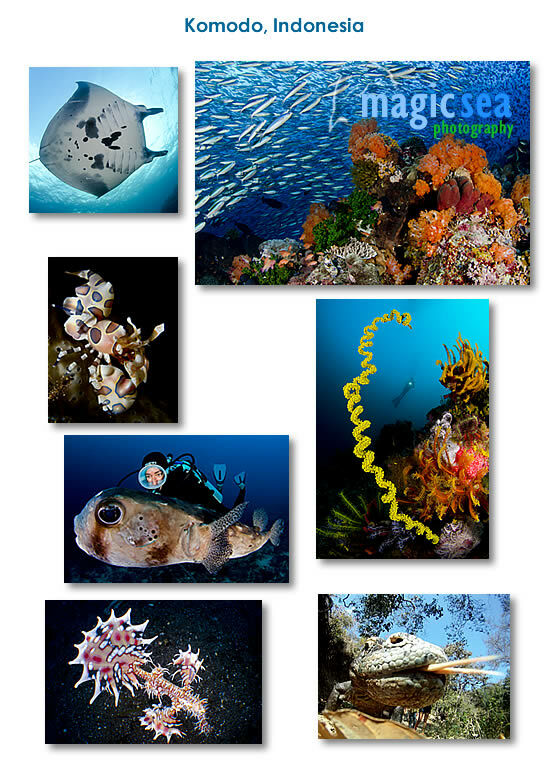 April 2007 : On assignmet for Sport Diver Magazine. 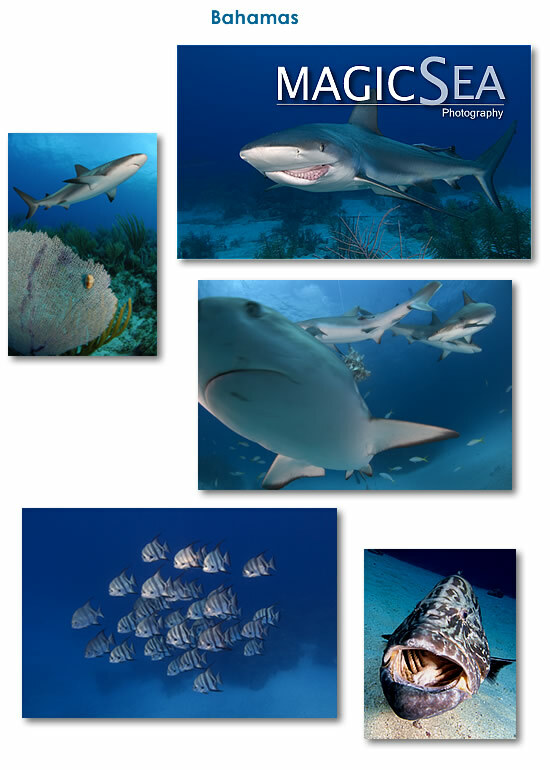 Photographing reefs and sharks in Cat Island, Nassau and Andros. February 2007 : On assignmet for Sport Diver Magazine. 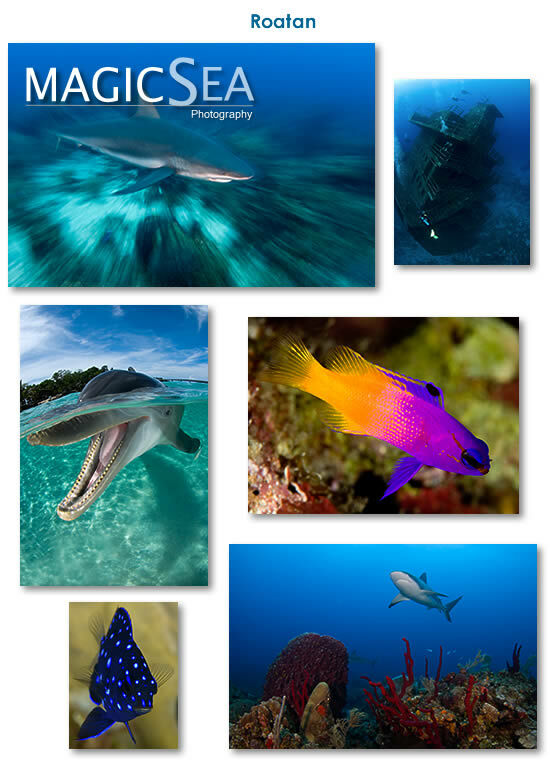 I visited the islands Spanish Lookout and Blackbirds Caye where I had the oppostunity to dive the famous Blue Hole and get close and personal with dolphins and the rare Caribbean Batfish. 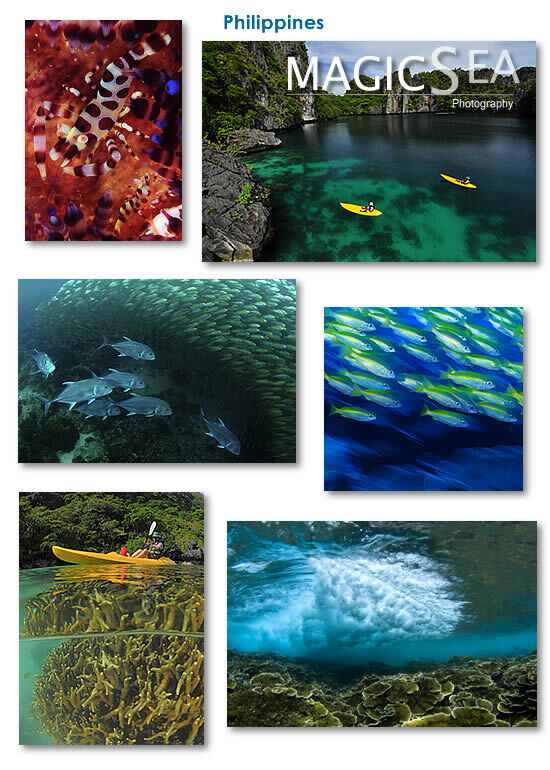 January 2007 : Last visit to Indonesia took me back to the Tukang Besi islands and Bira, south of Sulawesi: A beautiful combination of colorful coral reefs and amazing creatures. 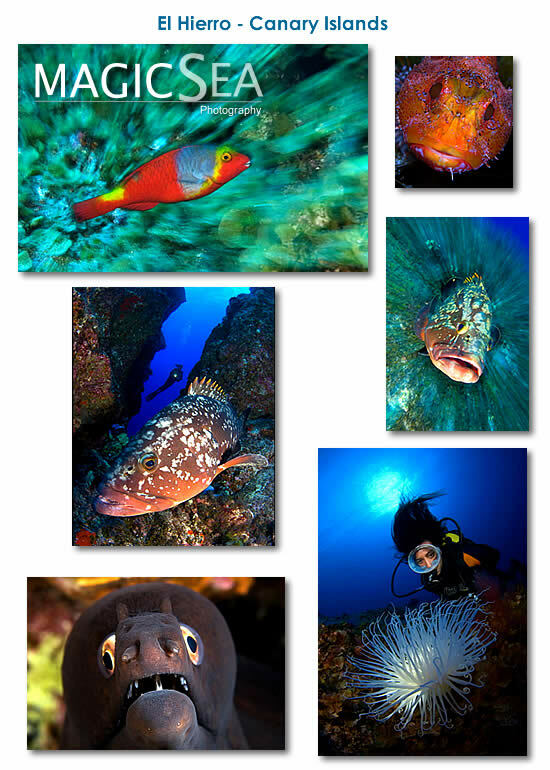 December 2006 : Recently I have been teaching a photography course in North Sulawesi, visiting the coral reefs around Siladen Island in the Bunaken National Park and diving with the most strange critters in the Lembeh Strais. 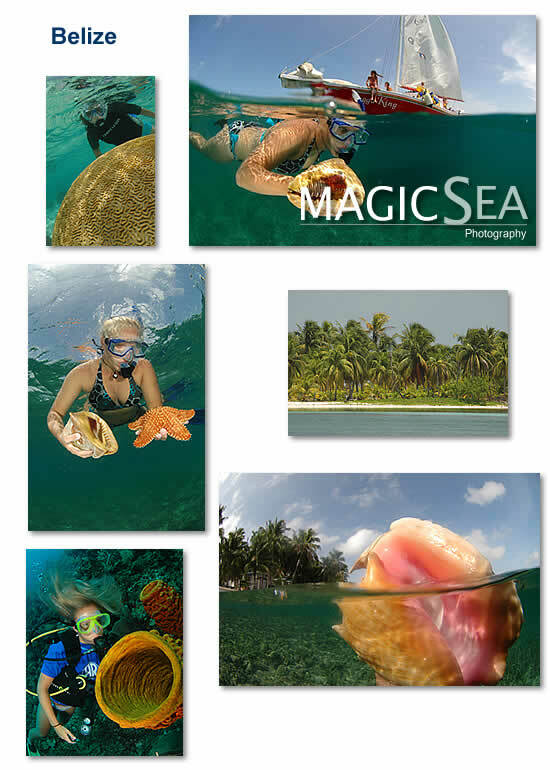 December 2005: Lush coral reefs and spectacular grottos are only some of the attractions of this Caribbean archipielago. 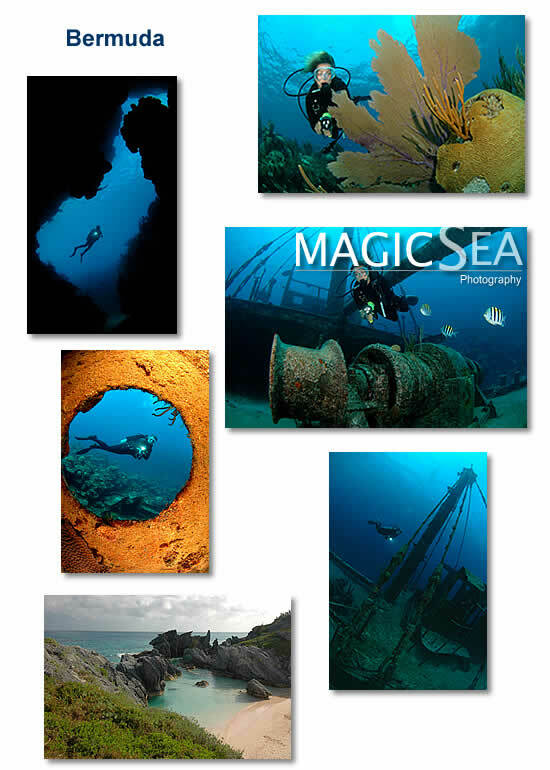 November 2005: On assignment for Sport Diver Magazine, submerged caves and shipwrecks abund in Dominican Republic. 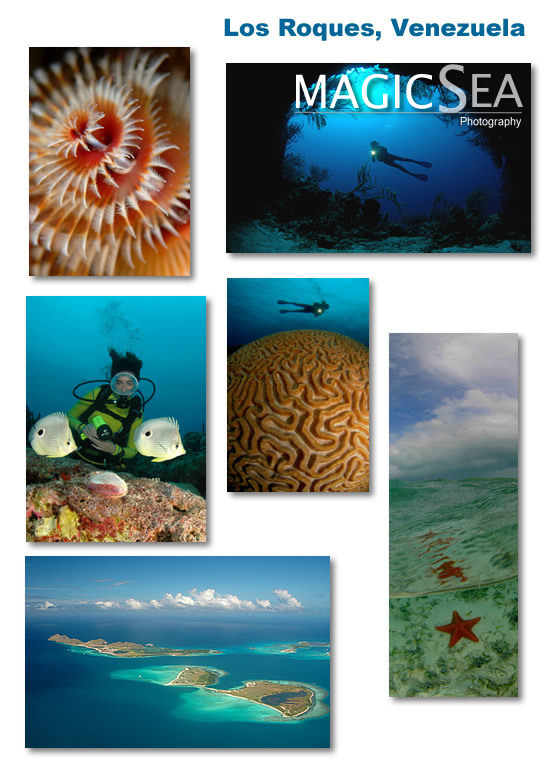 August 2005: On assignment for Sport Diver Magazine, I visit St. Statius, commonly known as Statia, one of the Dutch antilles in the Caribbean. 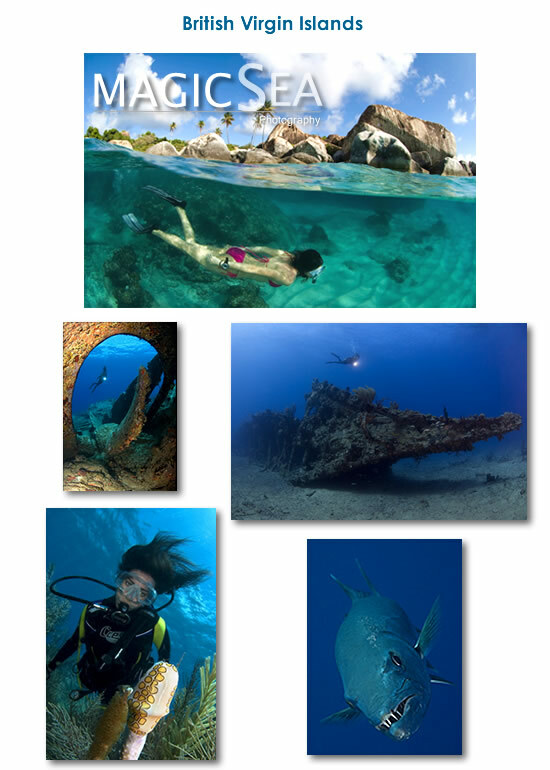 Wonderful diving with a great variety of reefs, wrecks and underwater life. 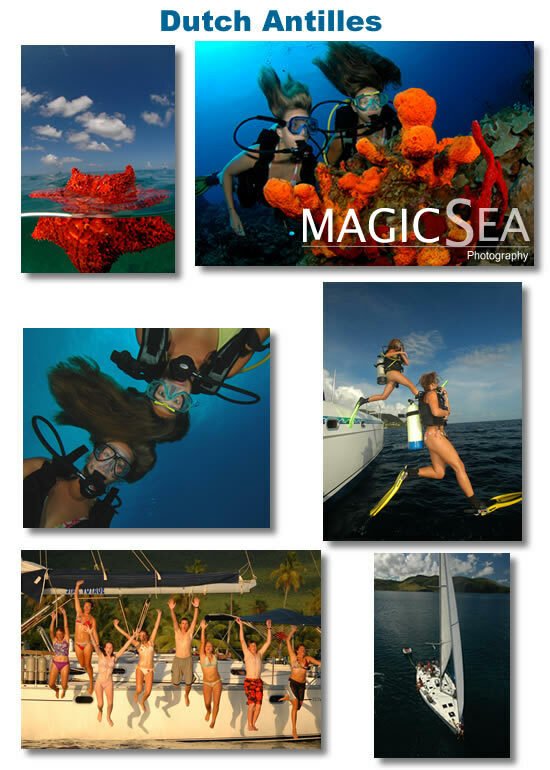 August 2005: On assignment for Broadreach, I travel to the islands of St. Kitts, Nevis, Saba, St. Martin... photographing the diving and sailing trips of a group of teenagers. 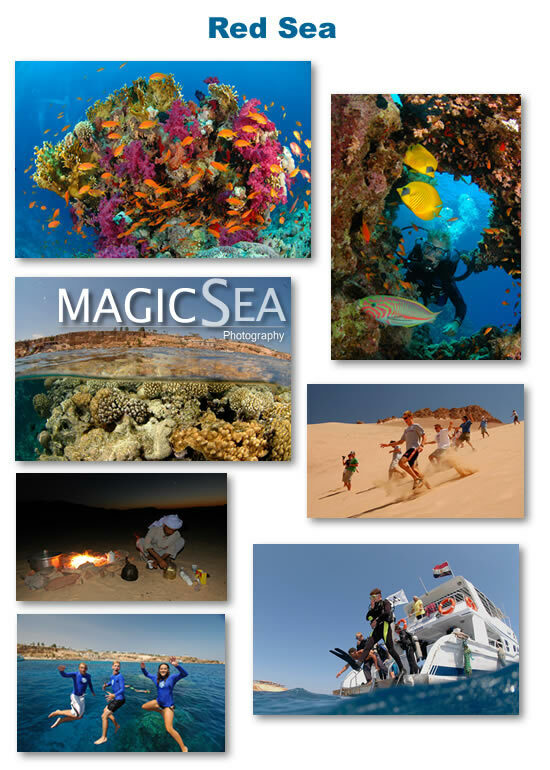 June 2005: I come back to the Red Sea, this time on assignment for Sport Diver Magazine, covering the adventures of a fun group of teenagers traveling through the Egyptian Red Sea and desert. May 2005: I hadn't been back in Indonesia since 1999. This time I went from Sulawesi to Komodo, covering the most representative areas of this big country. 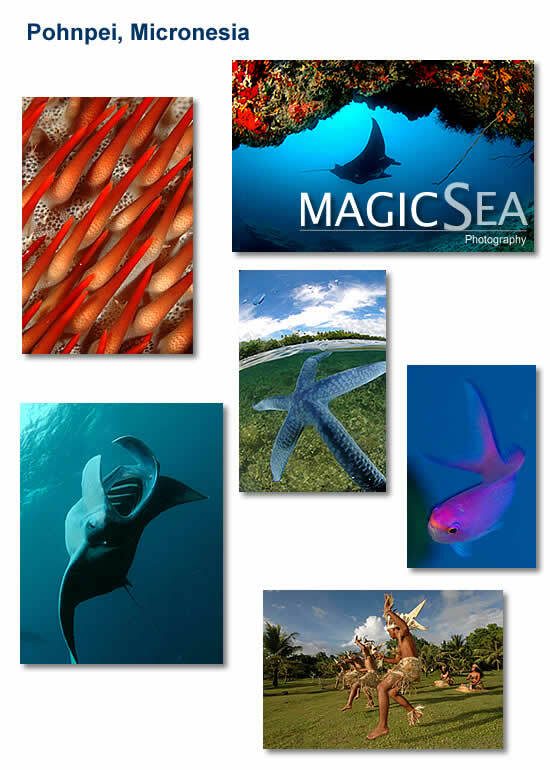 From tiny Pigmy seahorses to Mantas and gorgeous reefs.